With all the talk of the immense power of the 10mm Auto, where is the love for the similarly positioned .357 Sig round, which offers very fast performance, a moderately sized bullet and hard hitting energy transfer? While still not as recoil heavy as the 10mm, the .357 is not slouch in the muzzle snap department. 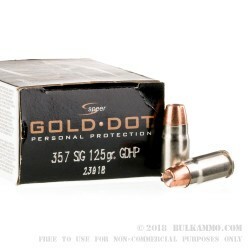 The benefits sometimes outweigh the drawbacks however, with the massive numbers that come along with the Speer Gold Dot .357 Sig load, in 125 grains. The velocity is a stout 1350 feet per second and it delivers 506 ft. lbs. of energy at the muzzle. 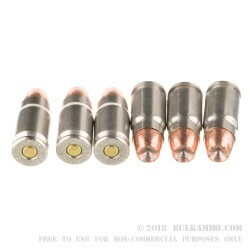 Those ballistics are right on par with the 10mm in its lower bullet weight configurations. The .357 therefore represents something of a unicorn with the high penetration, high velocity; moderate bullet diameter, great energy delivery and accuracy at larger engagement distances. It’s no wonder that the law enforcement agencies that adopted it, did so without reservation. 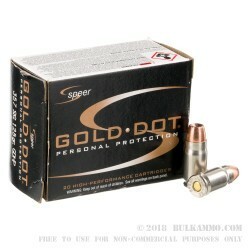 An excellent personal defense choice, the Speer Gold Dot .357 Sig is a powerhouse round with excellent ballistics and a milder recoil than some of the heavier rounds it can compete with. 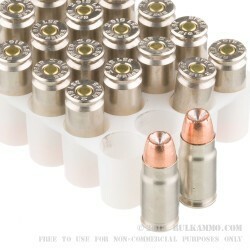 Suitable for use with any .357 Sig Firearm.